Following the June 1940 Armistice between France and Germany, French officers did their best to hide weapons and equipment from the German-Italian Armistice commission. The French army would return to fight again, starting in Tunisia. Free French forces rallied to oppose the Axis even before the Armistice was signed, but their total numbers remained small compared to France’s military potential. Even after the Armistice, the French regular army numbered over 200,000 men, at least on paper. If they could be turned against the traitorous Vichy Republican government, they would represent a notable addition to Allied strength. The French Armee d’Afrique entered action in November 1942, first seeing brief action against Allied landing forces in Morocco and Algeria, and then against the Axis in Tunisia. Eventually the French troops would receive modern American equipment, but they initially went into action with the weaponry on hand. 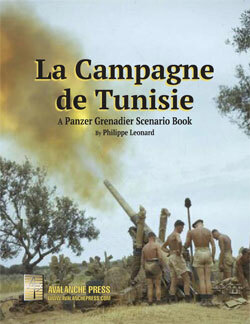 Those battles are the subject of Panzer Grenadier: La Campagne de Tunisie, an expansion for An Army at Dawn. As in An Army at Dawn, the French units included in La Campagne de Tunisie are in the livery of Vichy France. They wore the same uniforms throughout the campaign, whichever side on which they fought, replacing them with American-issued battle dress after the fall of Tunis in May 1943. There are no French infantry pieces included in La Campagne de Tunisie – those are already present in An Army at Dawn (which includes a small French contingent). The Italians had insisted that the armistice forbid French units in Tunisia from possessing anti-tank guns, but the French managed to successfully hide a few weapons – or make them. The “37mm Mar” were home-made anti-tank guns fabricated by French Navy machinists in their workshops in Bizerte. They removed Hotchkiss 37mm anti-aircraft guns from French warships for “maintenance,” and then secretly cut down the barrels and built sights, splinter shields and carriages for them. In all 36 of the guns were built, and they served with the French Marine anti-tank companies and with the 62nd Regiment d’artillerie d’Afrique. The French Navy's home-made 37mm anti-tank gun. 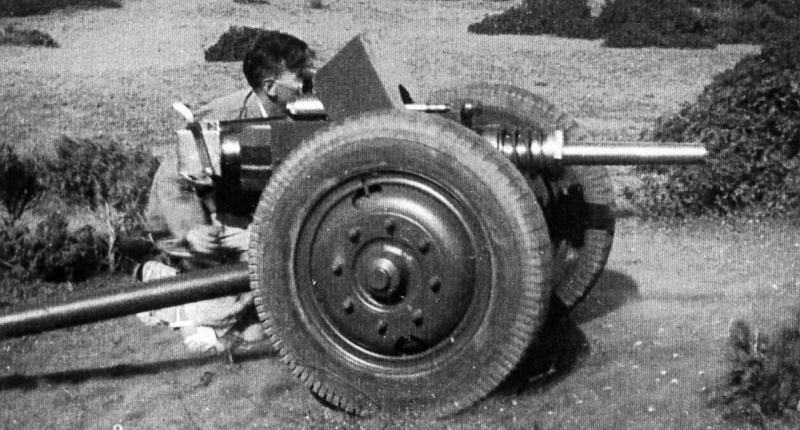 The Hotchkiss 25mm SAL anti-tank gun had been the French Army’s standard piece before the war, and also equipped units in North Africa. Many of the guns went to France with their parent units during mobilization, and others were confiscated by the Axis Armistice commissioners. A few managed to be squirreled away, but by late 1942 they were hopelessly obsolete. Far more effective was the 47mm APX anti-tank gun developed by Puteaux Arsenal. The best anti-tank gun available in 1940, few of them had reached the troops when the Germans overran France. It’s not clear whether any of these guns had reached North Africa before the Armistice, but apparently a few made it past the commissioners afterwards. A number of second-line French units had been issued the Great War-era 37mm TR (“Tir Rapide” – Rapid Fire) infantry gun in place of actual anti-tank guns as it did have a minimal capability against armor. Despite the weapon’s age, the troops apparently liked the little gun, as it delivered on its promise of rapid fire and was very accurate. It could be fitted with wheels for towing, or with a shield, or fired from the ground which allowed it to be dug in very effectively. On paper, the gun would have 120 high-explosive and 80 anti-tank rounds in its ammunition panniers, but the Axis Armistice commission apparently did not consider it an anti-tank gun. In first-line units, the little infantry gun gave way to the light mortar as a support weapon. The French actually issued two different light mortars, the 60mm Brandt Model 1935 and the 50mm Brandt Model 1937. The 50mm version had not been issued to many units in June 1940, and was intended as a platoon-level support weapon. Over 20,000 of them had been stockpiled in arsenals, but sufficient ammunition had not been produced yet, nor had the troops been trained in the weapon’s use. The 60mm version tossed a round a little more than twice the weight of its little brother’s, and in the French Army it was deployed in dedicated mortar platoons like the bigger 81mm Brandt mortar. This is why it receives playing piece in French or Romanian colors in Panzer Grenadier, while the same mortar in American service (built under license as the M2) or when captured by the Germans (as the Granatenwerfer 225(f)) does not, since its firepower is incorporated into that of the infantry platoons to which it was issued. The Marine Nationale also provided a number of anti-aircraft guns removed from warships. The larger-caliber guns were often too heavy for effective use in ground combat, but the Navy’s machinists placed heavy 13.2mm anti-aircraft machine guns in double or quadruple mounts and these initially filled the role of light anti-aircraft protection for the troops. Italian divisions in North Africa depended heavily on the 65mm Model 1913 mountain gun for artillery support, thanks to its ease of transport. The Italian gun had been based on the French 65mm Model 1906 mountain gun, which was replaced by a more effective 75mm gun in the late 1920’s, and only 70 were still on hand during the 1939 mobilization. Apparently those held in North Africa were not considered worth transporting to the Metropole, and they went into action in 1942 despite their short range and small shell. Mountain guns had less use to the French (outside of actual mountain terrain) thanks to the wide availability of the standard 75mm Model 1897 field gun. Over 21,000 of them were built, and despite widespread exports 4,500 of them still in French service in 1940. French workshops in North Africa secretly mounted 30 of them on the back of flatbed trucks; when the Allies invaded 12 of these home-made self-propelled artillery vehicles were hidden in Morocco and another 18 in Tunisia. The Tunisian vehicles equipped the self-propelled battalion of the 62nd Regiment d’artillerie d’Afrique, divided between the brigade group in Tunis and the reserve at Kairouan, and saw action against the Axis. Next time, we’ll look at the French tanks and armored cars. There are more of them in La Campagne de Tunisie than you’d think.